Business owners everywhere are wrapping up the year reviewing what was and planning for what is to be. A major area of review and planning will be your visibility. Are you being found by the right people, what social media platforms do you get the best results from, and what tools have been the most useful in facilitating those relationships on those platforms. It’s no secret that live video streaming is one of those tools. In this post, we’ll look at the most relevant live video streaming apps for 2019, why they’re relevant, and a top tip for successfully using each one. Top tip for Twitch.tv – Because of the new market expansion, you need to show up consistently so that as new non-gaming users join, they can find you quickly and easily with relevant content! #2 YouTube – An incredibly powerful search engine in itself, this platform is a top choice for live streamers everywhere. The thing I really love is the ability to publicly stream live (relatively simple process) and then easily hide that content post broadcast. This feature can come in handy if you’re trying to increase live viewership and engagement. As hidden, the video still lives on YouTube and can be made publicly visible or privately visible to those you specifically assign permission to. This is a nice functionality that’s not available on Facebook without first downloading and then removing the video, which takes some time and you lose the “live replay” aspect which is a bummer! Top tip for YouTube – Create categories to sort your videos under and be sure to use key words in your title and description…remember, YouTube is a powerful search engine! #1 Facebook – The combination of over 2 billion users and the simple, robust, and user friendly functionality of Facebook’s live video feature make this a no brainer for the number one spot! It’s easy to use, like, comment, share, and tag live videos on personal profiles, business pages, groups, and even events! If you’re in business in 2019, you need a presence on Facebook and having a live presence will make it that much easier for people to get to know, like, and trust you. Top Tip for Facebook Live – Use your business page for quick tips, how to’s, FAQ, etc.…Then, as you’re networking, and you come across someone who has a question or needs information that you have done one of these quick live videos on, you can share it with them. This showcases you as the expert, helps your connections, and increases your views, which has a positive effect on the algorithms. If the content is super relevant you can continue guiding people to that live replay for months or even years! The key is to keep them short sweet and to the point! Bonus tips: Use a group to share more in-depth training, use an event to go live on location, and do a quick behind the scenes on your personal profile. Instagram – Instagram fans everywhere might be disappointed that this App didn’t make the top 3. Here’s the thing, as a business owner, you need good analytics on your live videos, you also need the ability for people to easily search and find your live video after it becomes a reply. Instagram does not do either of those things, which is why it is not in the top 3. Live streams on Instagram disappear immediately unless shared to stories and then, you only get 24 hours out of it. So why an honorable mention? If you’re actively using Instagram and have a decent following, it’s a smart move to use the live video feature to stay relevant and top of mind with your community. Adding live video into the mix of your fab photos also helps to change things up and boost your wow factor! Top Tip - Stories expire after 24 hrs. So remember to add fresh content regularly. Your live stream can be short sweet and to the point, a quick hello, ask a question, or give a sneak peek are 3 fabulous ways to use live stories to boost engagement and visibility while staying relevant! Please don’t feel like you have to use ALL of these apps, especially if you haven’t been consistently using live streaming in your business. You don’t want to overwhelm or put undue pressure on yourself to manage all the things. That goes for the rest of your social media as well. Yes, set up profiles with links back to you, but don’t worry about being active daily everywhere. 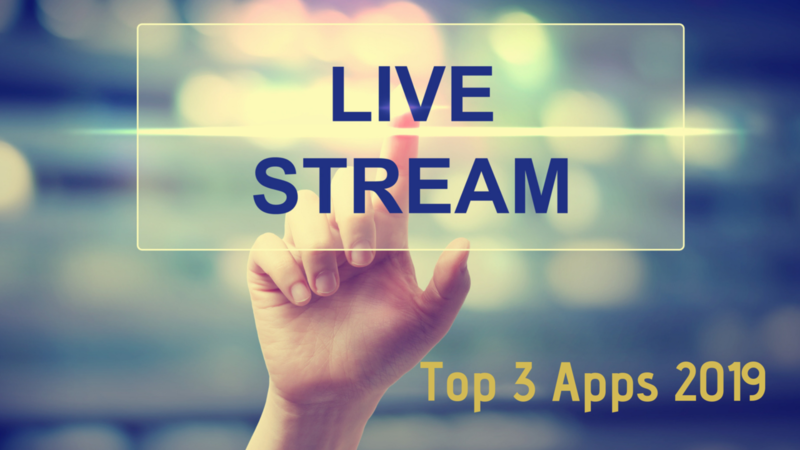 How to decide which live streaming app is best for you! As I said in my number 1 choice above, if you’re in business in 2019, you need a presence on Facebook. With that said, let’s look at some factors to help you decide where YOU should focus your efforts. Do you have a large following on a platform? If no, consider adding Twitch as a regular part of your live streaming. With their newly expanding market, new members will be on the hunt for relevant to them content, of which there will not be an abundance of right now. Leverage this expansion stage to amass a following. If yes, that specific platform should be a priority. It can take a lot of time and energy to build a community, if you already have one somewhere, nurture it! Add in another platform IF you feel comfortable with your current availability. If Facebook is not the platform you have a community on, I highly recommend you add it. If Facebook is that platform, then think about your ideal clients, what is their 2nd favorite platform? If you’re not sure, ASK them, take a poll. Agree, disagree? I'd love to hear your thoughts! P.S. If you’re looking to improve or even start you live video presence, take the FREE masterclass - CLICK HERE NOW!